If you’ve “gone low-carb,” you might get tired of seeing recipes for things you love, but that no longer fit your new lifestyle. I’ve been eating Keto for a year now, and I can get by with relatively few treats, but when my daughters decided to join my adventure, my Pinterest feed became nothing but low-carb desserts!! They want the health benefits of eating well, with all the frills too. 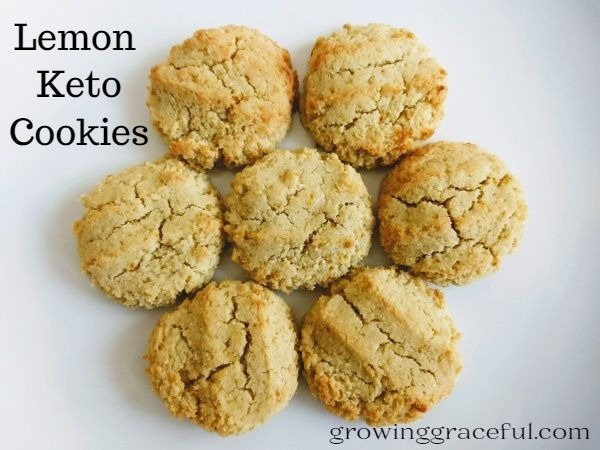 Recently, they were feeling deprived when their siblings enjoyed some Lemon Breakfast Cookies of the gluten-free, sourdough variety, so I whipped up these Lemon Keto Cookies, and they are every bit as good! I make these as a breakfast cookie for my family, although they make a nice treat any time. If you like a sweeter dessert, adjust the sweetener to suit your preferences. 1 cup almond flour; I find the best buy at Costco. ** 3 TBS Erythritol plus 1/8 tsp Sweet Leaf Organic Stevia Extract, OR 3 TBS Swerve Brand Confectioners Sweetener. zest and juice from half a lemon (approximately 1.5 TBS of juice); The zest and juice freeze well for later use if you are inclined to process the entire lemon now. Preheat oven to 350 degrees. Mix the dry ingredients in a medium sized bowl. Cut in the butter and add egg, lemon zest and juice. Allow to rest 5 minutes for the dough to firm up. Line baking sheet with parchment paper. Using a 1.5 TBS scoop, drop dough balls onto baking sheet and press flat with your hand. Bake and then allow to cool: Metal baking sheets like the Air Bake brand will take 15 minutes. Bar pans like Pampered Chef Brand will take a few minutes longer and the bottoms may not firm quite as much until after the cookies have cooled. Macos were calculated on cronometer.com. I have not included erythritol in the net carb count since it doesn’t affect my blood sugars. If erythritol affects your blood sugars, or you are using substitute ingredients, please calculate the nutritional information on your own before trying this recipe. 😊 You are such an encourager! I shall be trying these as soon as possible. Thank you for posting. I can’t wait to try these. My husband is a lemon freak. They look wonderful!